Found a semi local group of guys that are running rally races and I've always thought it looked like fun. I have an old TC4 that's been sitting on the shelf for a while and figured that's as good as anything to build a rally car from. I bought some cheap universal 60mm shocks on Ebay, the cheapest rally tires and wheels I could find and got to work. 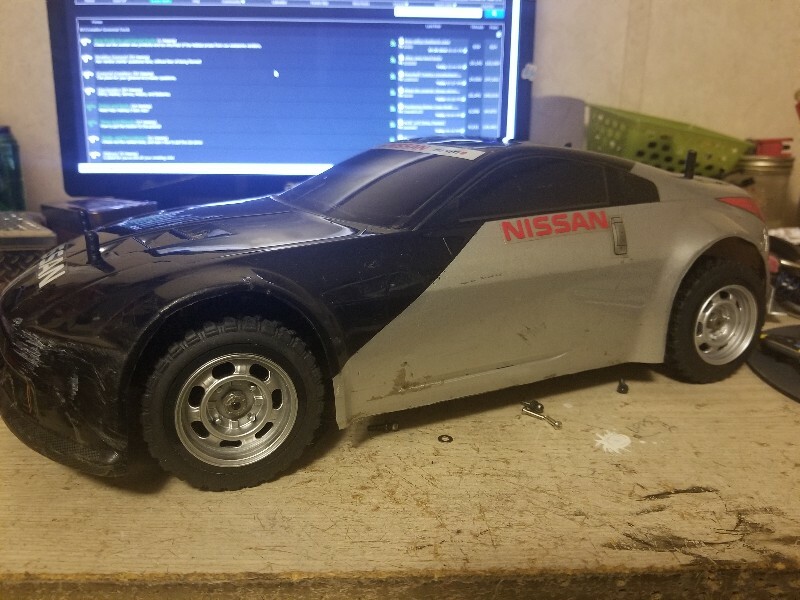 I had to trim the chassis and arms and hubs to get some droop. The local group rules limit us to 21mm ground clearance at ride height and I'm right at 20mm. 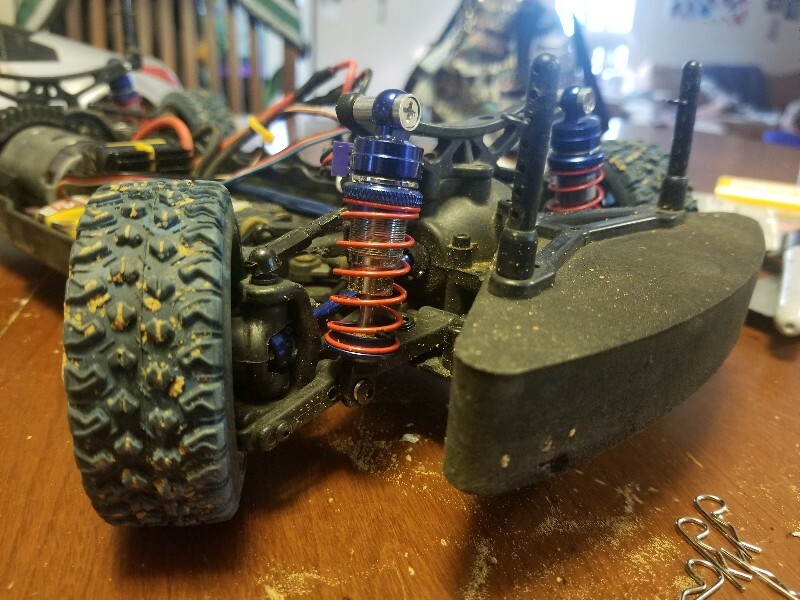 I'm recycling electronics so I'm using an old yellow Traxxas XL5 and a Tamiya silver can motor. I can't even say what the servo is because it's been in the car since before I got it. First pics as soon as I got her put together. 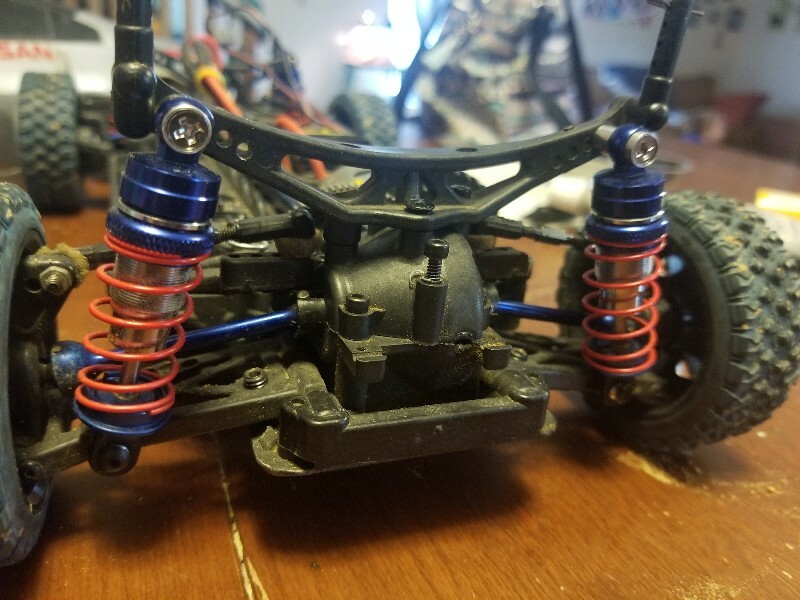 My super cheap shocks. All aluminum body, super strong setup and nice smooth movement. After one time at a friends track I knew I made a mistake and I had way too much fun. The car drives smooth and corners great. The jumps on the track were small but handled it perfect and jumped really flat and my cheap shocks did perfect. We all took turns driving and my friend got maybe 2 minutes before he pulled the shock towers off the diff housing. We didn't even get any action shots because we were having too much fun. Last edited by struhall; 09-16-2018 at 11:07 AM. I still don't know if this is the body I'm going to keep or if I want something different. 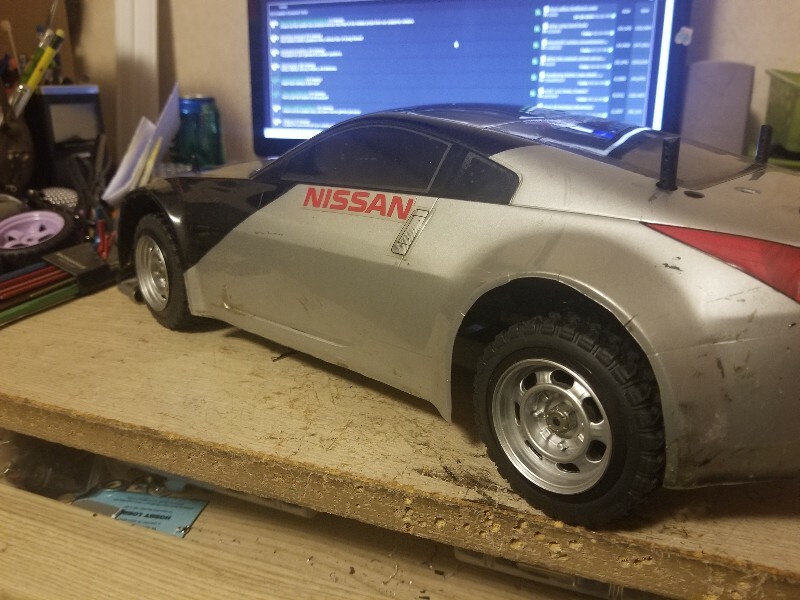 Even if I want to keep the 350Z body I'm going to buy a new one. The group rules require clear windows and the headlight stickers that are missing. Plus she needs to be a better color than black and silver. Those wheels are really cool !!! The wheels are one of the cheapest 1.9 glue on wheels on Ebay. You can get them for $11 with the tires. There are cheaper options but they're hideous looking. The body doesn't cause any problems, it barely hangs past the front bumper foam, I just don't know if I like it.